Rinse rice 3-5 times until water is starting to run clear. Drain rice in colander or strainer while making the vinegar mixture. Combine rice wine vinegar, sugar, and salt in a bowl and mix well. Add the drained rice and water to a pot. Bring rice to a boil quickly and then reduce heat to a simmer and cover the pot. Simmer for 15 minutes, remove from heat and let sit for 10 minutes, covered. 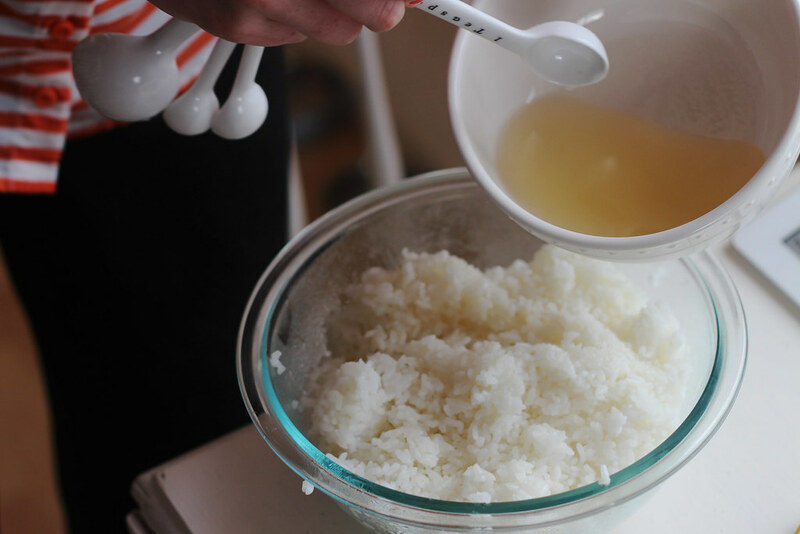 Transfer the rice to a bowl to let it cool and slowly add the rice wine vinegar mixture, stirring carefully. *The key to good rice is not taking the lid off the pot until done! Before preparing your ingredients, put your cream cheese in the freezer to make it easier to cut. 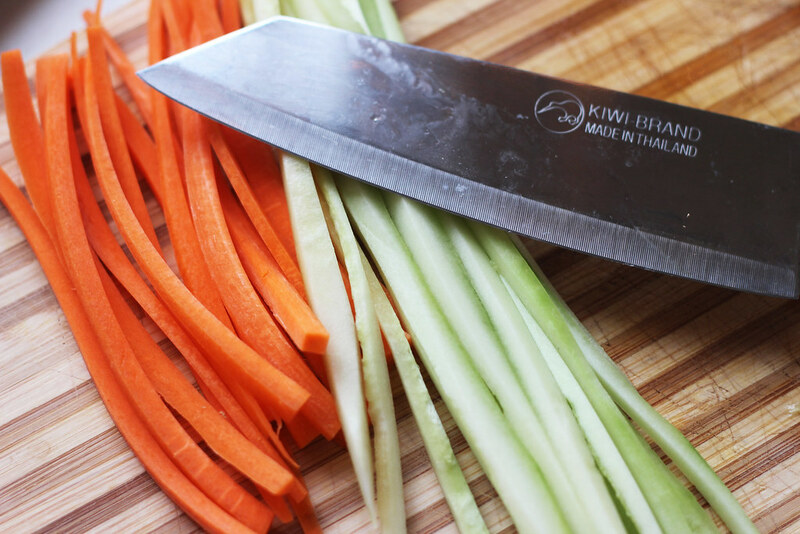 Thinly slice cucumber and carrots (as shown above), keeping them about the length of the nori sheet you'll be using. Cut smoked salmon into strips. Remove cream cheese from the freezer and cut into strips. 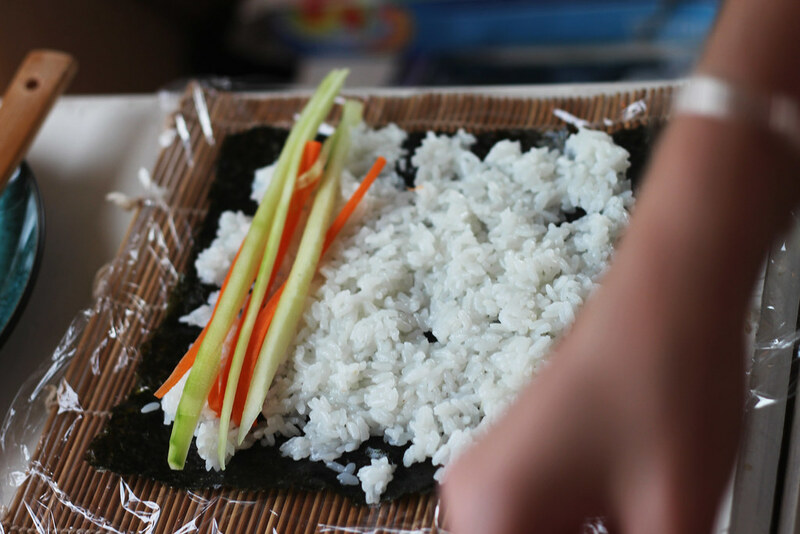 Lay out your sushi mat and cover with syran wrap if desired. 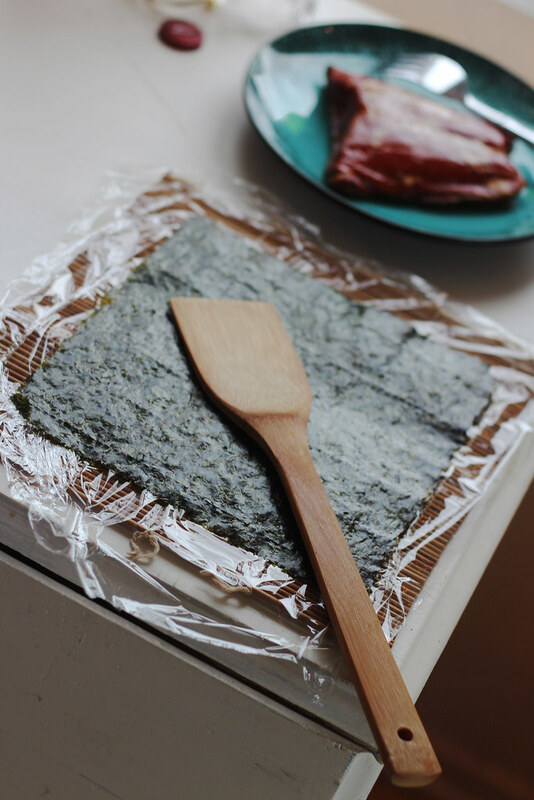 Lay nori sheet on top of the syran wrap and add a thin layer of warm-room temperature sushi rice, making sure to leave a thin border of nori so that your roll will stick together nicely. 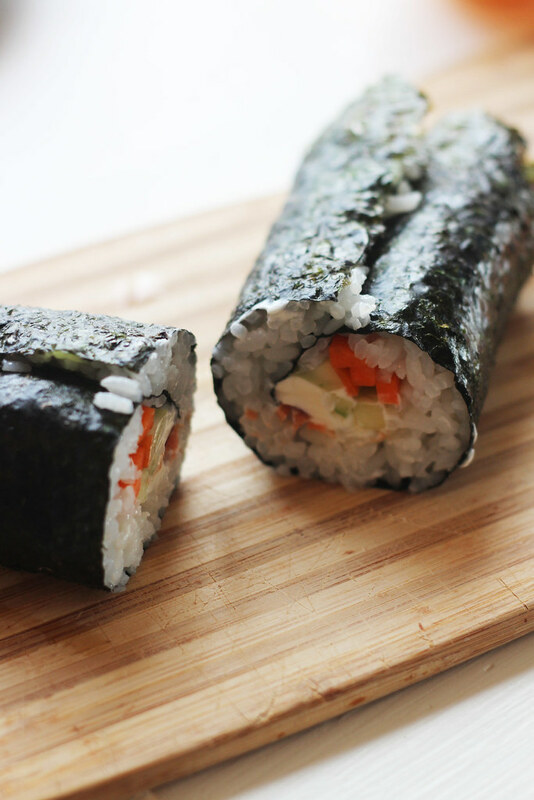 Add cucumber, carrot, smoked salmon, and cream cheese at the end of the roll keeping the ingredients within the borders of the nori. Slowly roll the sushi up, pressing down with the mat while rolling to keep it firmly pressed. 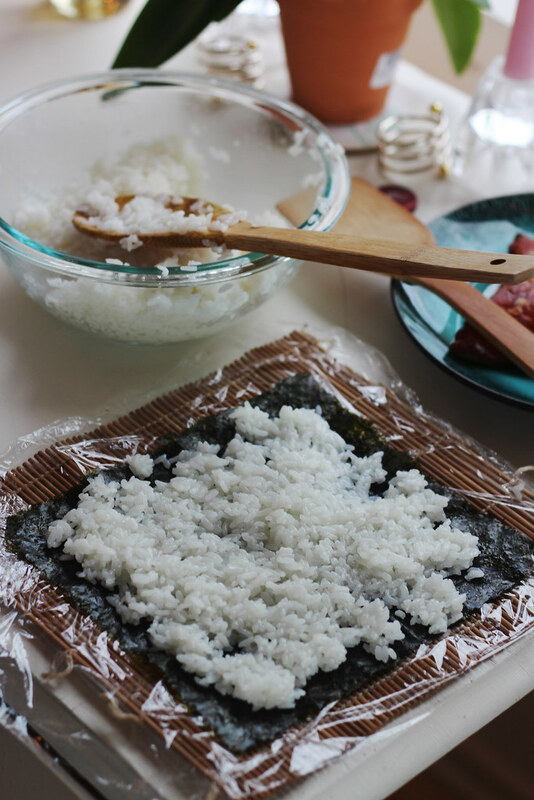 Once rolled, remove the syran wrap and mat and slice sushi with a knife dipped in warm water. 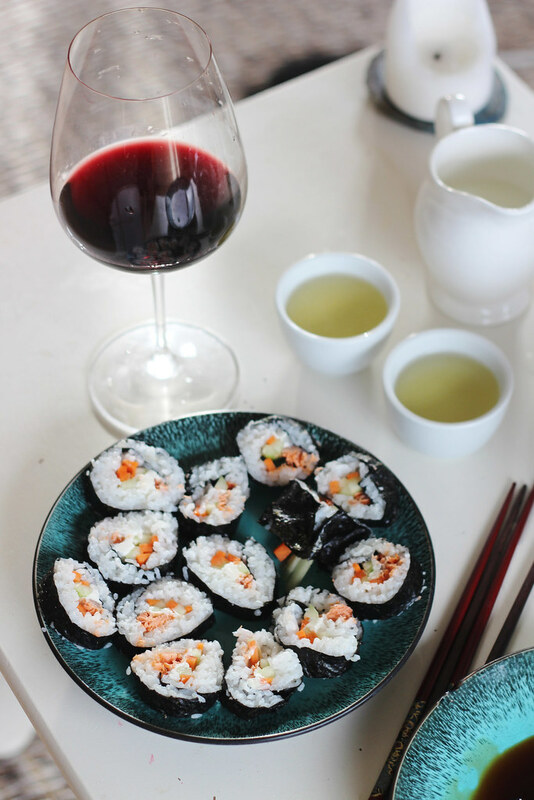 Serve with wasabi, soy sauce, and green tea and enjoy! *Sushi rice recipe modified from this recipe. This looks so very yummy! I so wish I could have sushi right now! I've always wanted to try sushi, but never have been able to because I was worried about cross contamination since I'm allergic to shell fish, but now I can make it myself. 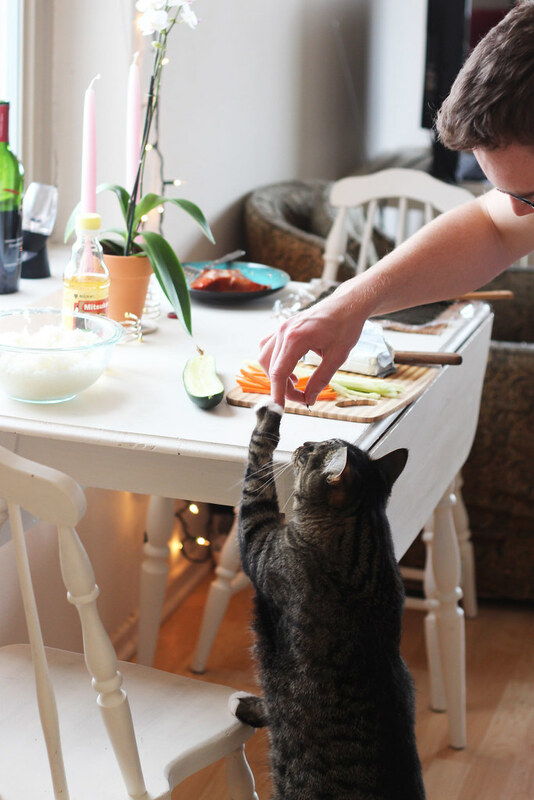 My husband and I love sushi, but we've never tried to make it at home before. This sounds easy enough, and delicious, thanks so much for sharing! This looks yummy! Thanks for posting this! On my bucket list is definitely learning how to make sushi or just take a sushi making class! These look so yummy! 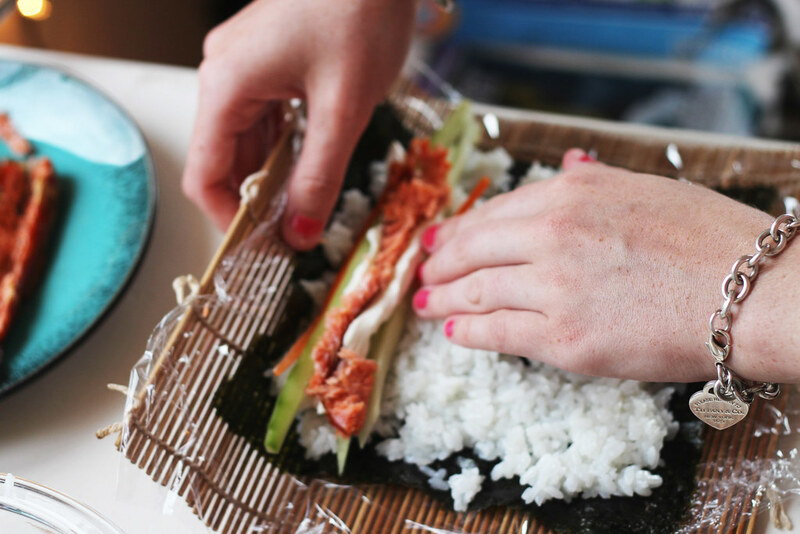 Making homemade sushi is so much fun. I use to make it for my ex all the time. I don't eat seafood though so id settle for a salad. I hope you've had a great weekend! Looks so good! I've only made sushi once before. I should try it again soon! This looks so delish that my mouth is watering already. I would probably take out the salmon and make it vegan...I can't wait to try making my own sushi rolls. Yum, I love making homemade sushi!!! YUMM!!!! the one thing i've been craving dring pregnancy is sushi!!!! can't wait to pop this baby out so i can eat it! this looks delish, now i'm craving sushi! i only tried to make it once a few years back and it didn't go so well....maybe i'll have to try again! 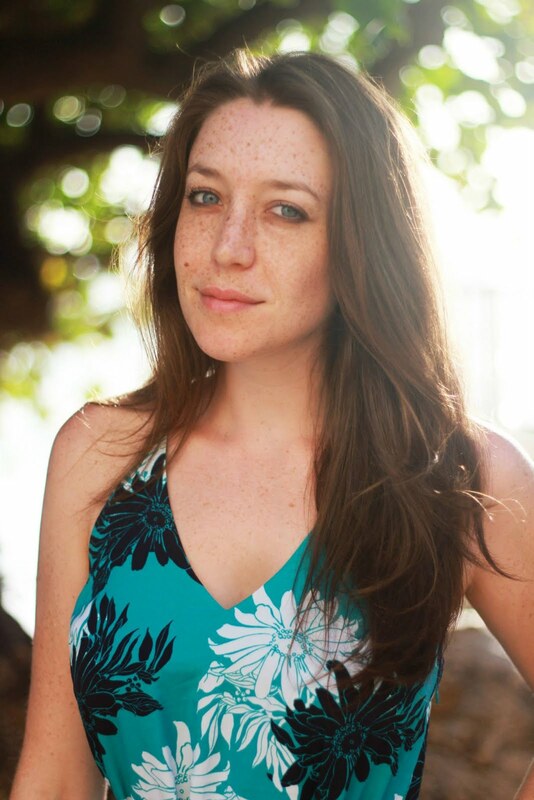 oohhhh gorgeous photos! I've only made homemade sushi once, but I definitely need to do it again! Magestic post, great pictures, point words, useful information! Yum yum yum!! 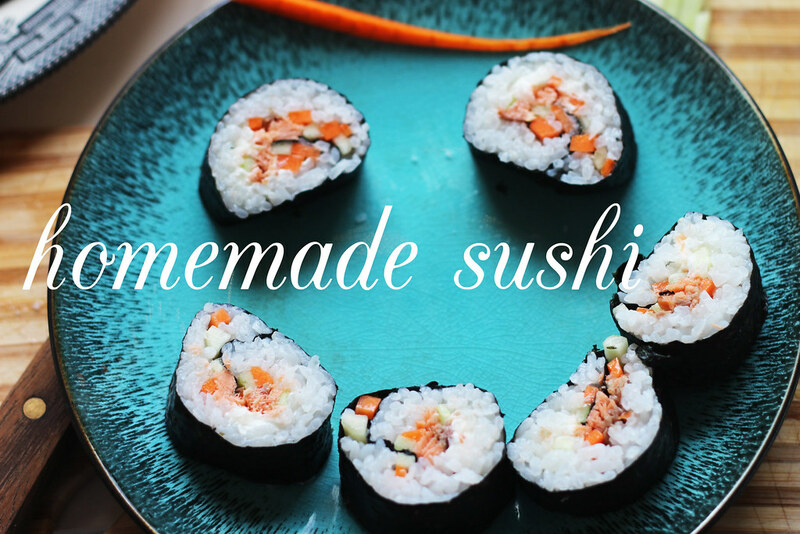 Sushi is one of my very favorite foods, and I have always wanted to make it myself! this is "maki-sushi". "maki"means "roll". looks yummyyyyyy ! !